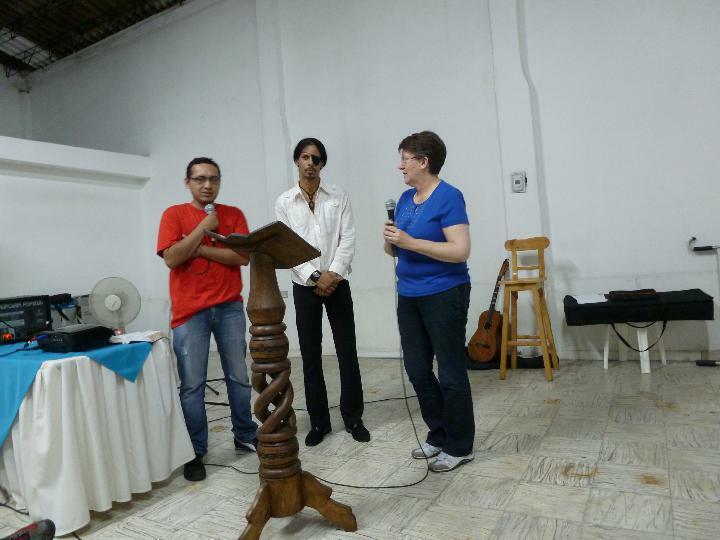 La Viñia Church, some wonderful stories, and Romao & the Sound of Drums…. This life of mine is never boring: and frequently throws up events that are mind-boggling, and a wonderful surprise. 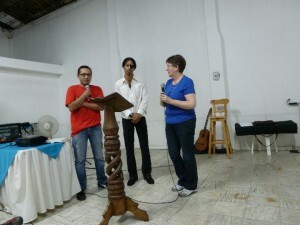 I am really fond of Oskar & Claudia Muñoz, the Pastors of the ‘La Viñia’ (The Vineyard) church: I’ve been there quite a few times now, and in April, it was where Omar had his miraculous healing, so it was lovely to see him again tonight, well, his scar – well, just like a stomach scar SHOULD look, rather than the red, bloodied, inflamed gash with a hole at the bottom. A lovely lady, Sandra, came and told me that a young mum I’d prayed for a year ago, who was then well pregnant, but who had major problems not only with the pregnancy, but also her kidneys, to the point where the doctors said the baby wouldn’t live, and would be stillborn at best…. well, Juan Philippe is now 7 months old, and doing perfectly well, despite being born early! Thank you, Lord…. Alan and Barbara both spoke, really well: Alan from Isaiah 54:17, the much (mis)quoted and (mis)used verse about weapons not prospering against us. He gets amazing insight that amazes me… :). Barbara spoke really well, telling her own story of God’s miraculous intervention in healing her chronic osteoarthritic knees. As usual, I went with a ‘prepared’ mesage, and ended up saying something completely different, the response was pretty much the whole church needing healing! ….who helped Omar out a bit translating for Alan, as Omar obviously hadn’t translated for an East Belfast accent before! Sensed, for reasons I could only assume was God, that God has hand very much on the patch young man – his name is Mandy Romao, his ‘stage name’ is Romao The Sound of Drums’ – apparently a pretty much in demand, well known percussionist/drummer on the club circuit, and has done live drum gigs for the likes of people I have heard of, and like, like Tiesto and Armind van Buren. The patch isn’t part of the act: it’s genuine. Mandy had a blastoma, I think he said, on his eye, when he was 3, in his birthplace, Cuba. His eye was removed, and a glass one put in. Then, many years later, mucking about in the Pacific Ocean, off of Los Angeles, where he grew up, with his cousin, his eye came out: and that was it – gone. I thought back to a lady in Australia a few months ago, who had been born blind, was, I guess, in her early 40s, and no, she didn’t want her sight, she was quite happy with and had got used to 2D life. There’s no point in praying for someone who doesn’t want to be healed, so I asked Mandy if he wanted his sight after all these years. Yes, he did: so we’ve hooked up on Facebook so he can tell me the news when his left eyelid bulges one morning when he looks in the mirror….. my guess is that that will be when he gets saved! And THEN…. he was here in Cali to do a gig in a big nightclub. The nightclub boss owns many classic cars, and Jhon, who is in Oskar’s church, had brought Mandy in one. A fully restored 1941 Chevrolet, 7 lite engine, straight 8 valve, like something out of Al Capone movies, or the old Untouchables, on TV! 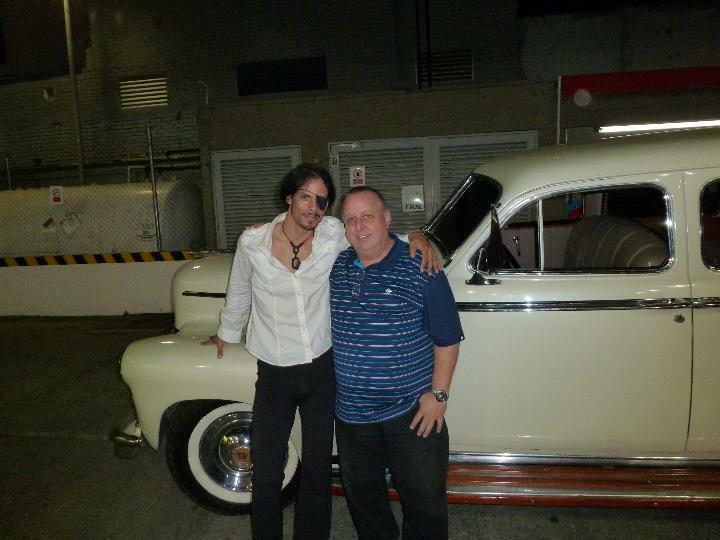 Jhon, like Mandy, is a really lovely bloke: and insisted, first, we have our pictures taken in it, and then that we allowed him the ‘blessing’ of driving us home….. so, so, so surreal, but an amazing – probably never to be repeated – experience! It was astonishing. I had an idea of how the Queen must must feel in her big Daimlers, except that this was MUCH bigger! 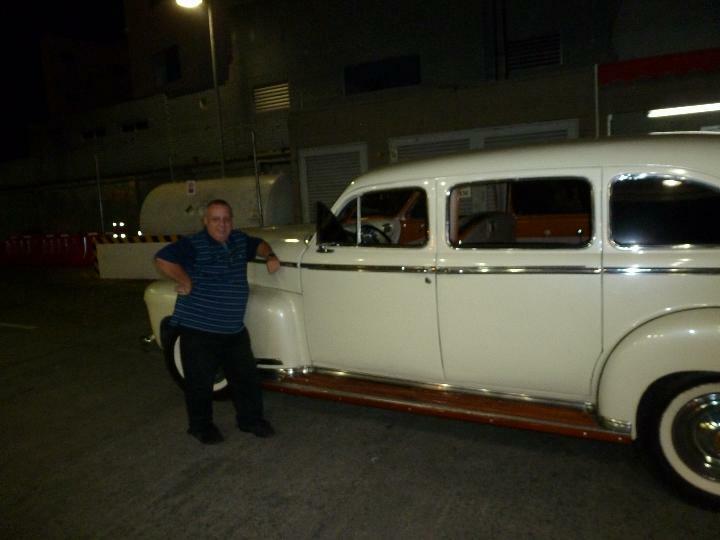 Some old git with some old car… ! Actually, it might be repeated, as Jhon wants us – or me if Alan & Barbara have gone before it happens – to meet his boss, who he’s been witnessing to over the last few months!